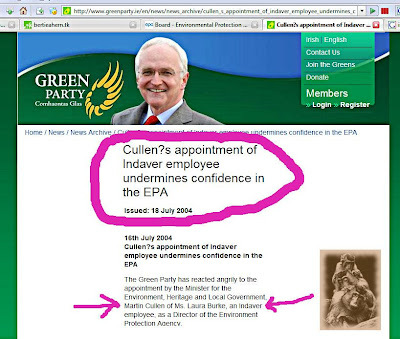 The Galway Tent Blog: Green Party: EPA-Ireland is Utterly Compromised. The Green Party has reacted angrily to the appointment by the Minister for the Environment, Heritage and Local Government, Martin Cullen of Ms. Laura Burke, an Indaver employee, as a Director of the Environment Protection Agency. 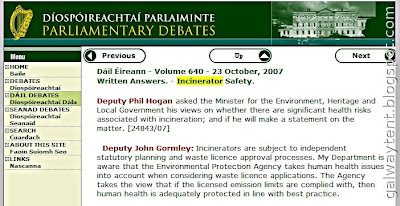 Green Party TD Dan Boyle said today, The appointment of Ms. Burke, having worked with Indaver Ireland, the company proposing the development of a domestic waste incinerator at Carranstown, County Meath and a toxic waste incineration at Ringaskiddy, Cork, utterly compromises the position of the EPA as a body seen by the public as being independent and impartial. Mr. Boyle said that the Minister for the Environment, Martin Cullen has made a series of appointments to the executive board of the EPA which show all too clearly that he sees the Agency as protecting the interests of business with environmental protection being given a very low priority. While current waste licence applications are still being considered by the EPA, involvement in their decision making processes by people who have been attached to organisations which prepared such applications, utterly undermines the credibility of the agency. We also note with interest that Indaver have speedily issued a press release welcoming the appointment.